On Mother's Day, we had a brunch and program for all the women at church. When we were discussing the menu, we decided to keep it simple. 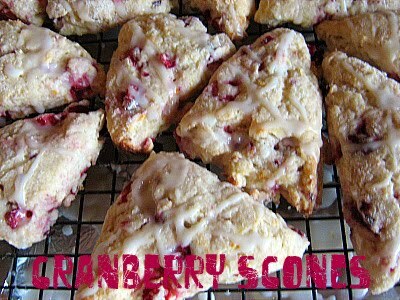 I suggested scones and volunteered to make a few varieties. I apologize for the bad photos, but they were taken in a rush, on my way out the door to church. 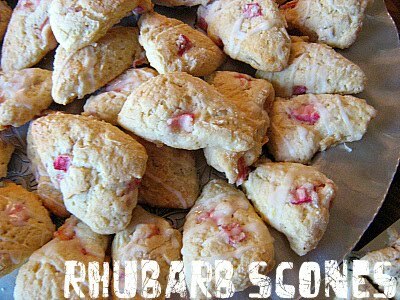 I made a few recipes that I have made before- like these rhubarb and cranberry ones (Yes, I had one last bag of cranberries in the freezer that I used). 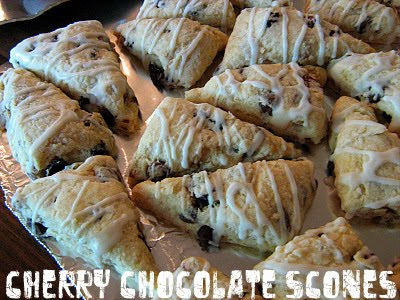 And I tried a couple new recipes, like the Cherry Chocolate Scones and the Ginger Scones- both were very popular. I also made a gluten-free scone, but used a gluten free mix and just had to add butter, buttermilk, dried blueberries and lime zest. 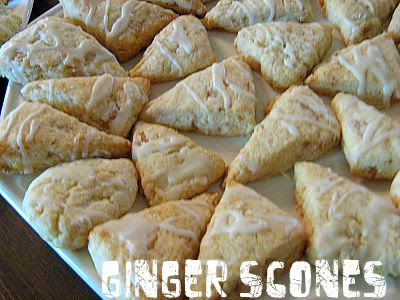 I used the Pioneer Womans' directions found in this post, to cut all my scones into minis, making them all much more figure friendly. Each recipe yielded about 30 or so mini-scones. 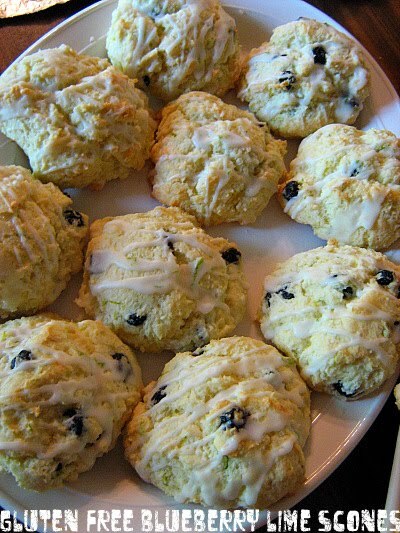 I also shaped and froze most of the scones ahead of time and just baked them straight from the freezer (just add a few minutes to the baking time)- a tip that Bridget shared on one of her posts about scones. 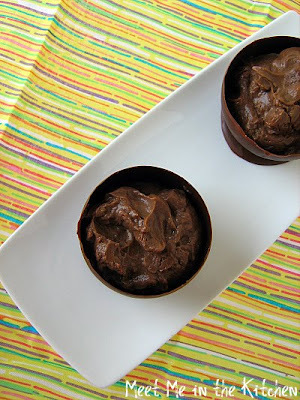 Have you tried freshly ground almond butter? It is soooo good. A couple of months ago a friend asked me what kind of peanut butter I used. She told me she got her's from Earthfare, where it is freshly ground from peanuts. Just plain peanuts. No added oil, sugar, salt, etc. like you find in all the jars that are commercially packaged. I went to check it out and was surprised by the price, which was so much lower than all the packaged peanut butters. Plus, the taste was unbelievable. Probably because it was really just peanuts. Funny how that works. You can even grind your own into a little plastic tub and watch the peanuts being turned into peanut butter. Point of story- It is the only peanut butter I use. I eat a little bit of it daily. It is so good. So, they also have freshly ground almond butter, which is a little bit more expensive, but oh so divine. 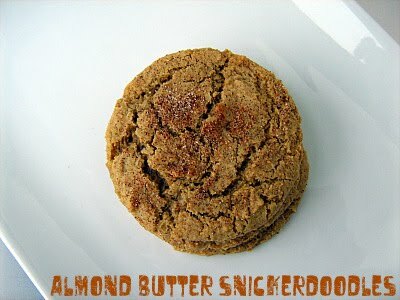 I saw this recipe in Cooking Light for Almond Butter Snickerdoodles and decided it was a great way to use a little of the almond butter. These cookies are superb. 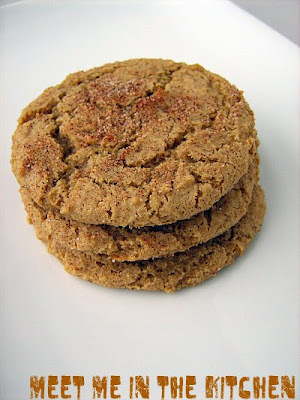 Not the traditional flavor of a snickerdoodle, but so much more complex and I think, so much better. There is lemon zest, whole wheat flour, and cinnamon- which all combine for a perfectly chewy cookie. The almond butter adds a delicious layer of flavor. My entire family loved these cookies. Even my husband- He couldn't tell they were "healthier". Can't wait to make them again. 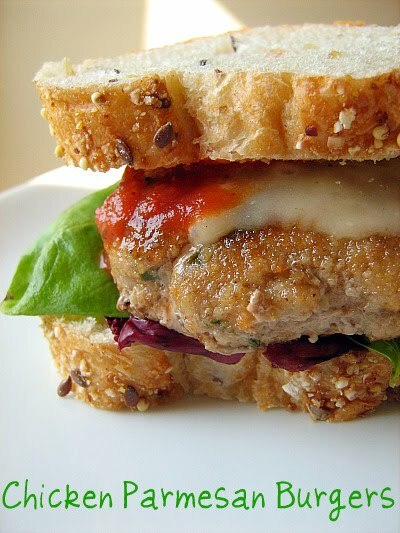 I saw this recipe for Chicken Parmesan Burgers in Bon Appetit magazine and thought it was a really fun twist on chicken parm and a burger. We don't eat burgers very often or meat for that matter, but these just looked too fun to pass up. I used some local, lean ground turkey (93 % lean) instead of ground chicken since it was from a local farm and I have switched the two before with great results. 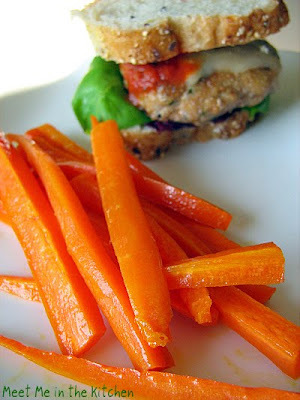 I had also seen a recipe for Carrot Fries that I wanted to try and this was the perfect opportunity to have a classic "burger and fries" dinner, but without the classic part. The burgers were great. I made them smaller than the recipe said because I used a whole grain baguette for the "bun" and didn't want the burgers to be too big for the bread. I used basil from my basil plant (Yay!- I love having my own herbs!) and used provolone cheese instead of the fresh mozzarella called for since that is what I had in my fridge. I think I overcook my carrot fries a little bit, but they were still delicious. This was a fun dinner. 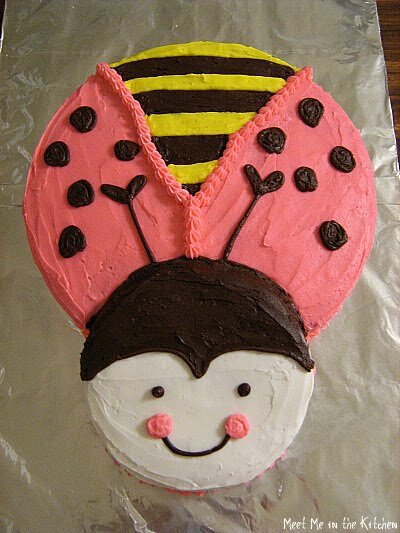 My son somehow saw this post by Bakerella and decided we needed to make this dessert as soon as possible. I thought it would be a fun one to celebrate school getting out and the beginning of our summer vacation. The idea and recipe are from Sticky, Chewy, Messy, Gooey Treats for Kids by Jill O'Connor. Somehow I totally missed this cookbook, although I do have the original Sticky, Chewy, Messy, Gooey, which happens to be the source of my husband's all-time favorite treat, Cheesecake Pops. A better picture can be seen in this post. 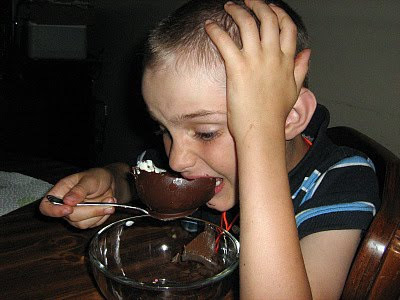 I tasted a spoonful and thought that the chocolate pudding had the perfect mix of pb and chocolate flavor and it was just sweet enough. Smooth and silky. Everything chocolate pudding should be. It does make enough to feed a small army. I should've halved or 1/3ed the recipe. 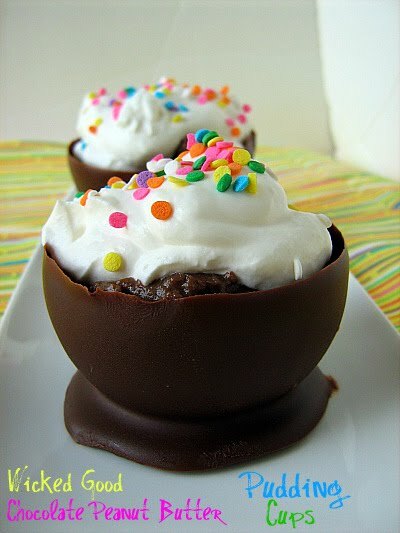 We used Baker's dipping chocolate for the cups- I would probably use a different kind of chocolate if I made these again. The water balloons were impossible to blow up with your own lungs. 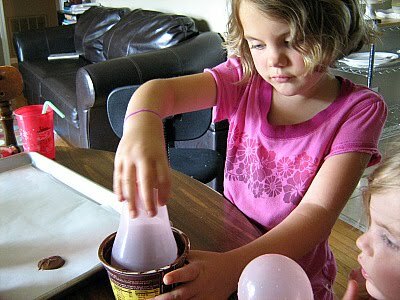 I had to use a basketball hand pump to blow them up. I saw a recipe for Grilled Veggie Pizza in Cooking Light and really thought it looked delicious. I decided to roast some veggies and make my own version of the pizza. I roasted 2 huge half-sheets of veggies w/ olive oil, salt & pepper in the oven for 10-15 minutes @ 425 degrees F- which gave me enough leftover veggies for a quinoa/veggie dish and quesadillas later in the week. I used a whole wheat pizza dough from my local grocery store to make the crust. *I used fontina cheese and the fresh thyme/mint herb combination, like the recipe suggested but chopped my herbs before sprinkling them on top. 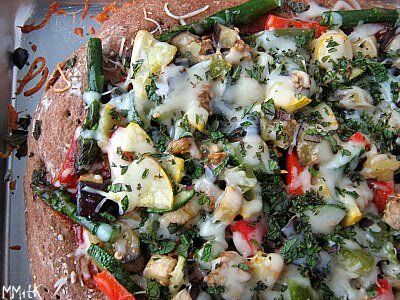 I really liked this healthy version of pizza and roasting that many vegetables at a time was great, because I had enough extra to last for a couple other meals during the week. What is your favorite way to top your pizza? 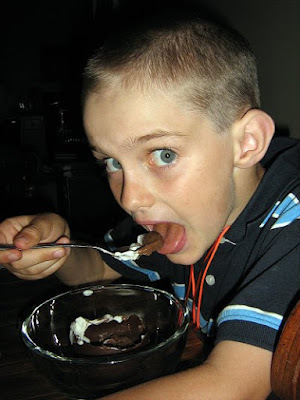 It has been almost 2 months since my family came to visit from Utah, but I still have some of the recipes that I made when they were here to post. My brother was begging me to make him muffins one morning and kept on coming up with all these crazy ingredient combinations. I can't remember all of them but he wanted something like this: berry-oat-mango-applesauce-whole wheat-banana-nut muffins. I remembered that we had leftover mango sauce from his birthday, so I decided to incorporate that into the muffins. Somehow I found a muffin recipe that included strawberries and a few other things and started messing around with it. I added the mango sauce, some whole wheat flour, oats, almonds- you name it and it was probably added to the batter. The good news is that these muffins turned out tasting great. My brother was very pleased. Healthy tasting, not too sweet, but still with a great flavor and texture. I wish he was here today so I could bake him more muffins. Nothing beats a teenage boy when you have baked goods to get rid of. Heat oven to 400°F. Grease and flour a 12-cup muffin tin or line with paper liners. In bowl, combine flours, oats, sugar, baking powder, baking soda and salt; make a well in center and set aside. In separate bowl, beat together buttermilk, egg, and egg white. Add canola oil, vanilla, and almond extract and beat well. 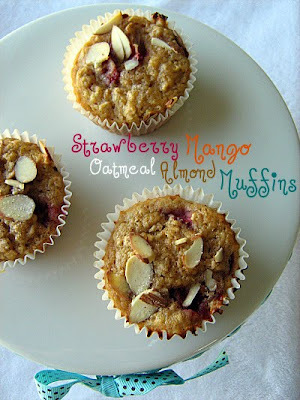 Stir buttermilk mixture, strawberries and mango puree into well in flour mixture, just until moistened. Fill prepared muffin tin 3/4 full. 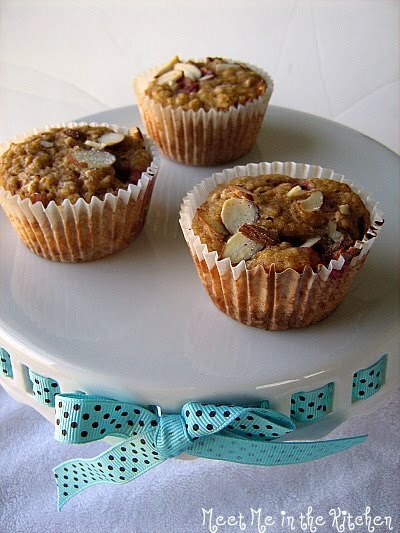 Combine sugar and cinnamon and sprinkle evenly over muffins. Sprinkle sliced almonds over top and lightly press them into the batter. Bake for 15 to 18 minutes or until muffins test done. Cool in pan on wire rack. 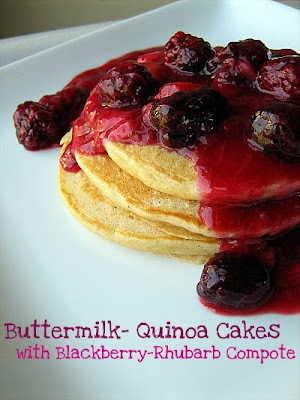 I checked out Deborah Madison's Vegetarian Cooking for Everyone from the library a week or so ago and was intrigued by a variation of her buttermilk pancakes that called for adding quinoa to the batter. I had some cooked quinoa in the fridge and decided to try it out. I also had blackberries and rhubarb, so I decided to make a tart compote to top my pancakes with. I noticed that Maria had done a rhubarb berry compote to top some pancakes recently, so I was inspired to create my own compote creation. I added some lime juice and zest to my fruit, a little sugar and water and then thickened it at the end with a little cornstarch. It was so tasty. Nice and tart. The pancakes were really good too. 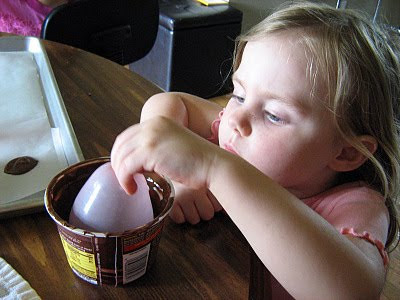 My kids ate them plain that entire day as snacks- they loved them. I used some of the leftover compote to top my oatmeal the other day and it was delicious. Also good with almond butter on toast. Yum. Mix the dry ingredients in one bowl. Mix the egg whites, egg, oil, buttermilk and vanilla in another bowl. Pour the wet ingredients into the dry and stir just to combine. Gently fold in the cooked quinoa. 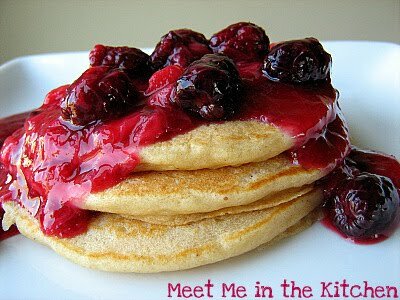 For each pancake, drop 1/4 cup batter onto a nonstick griddle or skillet over medium-high heat. Cook, without disturbing until fine bubbles appear on the surface. Flip over and cook until browned on the second side. Serve immediately or keep warm in a low (200 degree) oven until all are finished. Combine rhubarb, blackberries, lime zest and juice, sugar and 1/4 cup water in a heavy bottomed saucepan and bring to a boil over medium-high heat. Mix 2 Tbls cold water and cornstarch in a small bowl. Add the fruit mixture and lower heat. Cook for a few minutes more, until thickened. 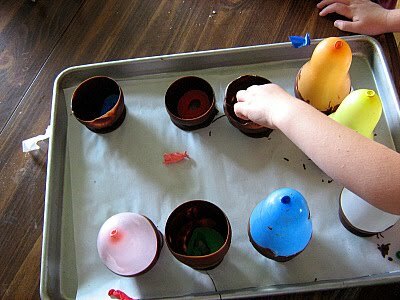 This past Easter we hard-boiled a ton of eggs. 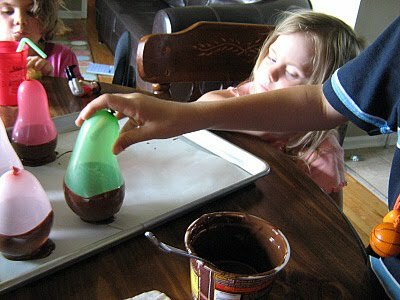 We wanted to make sure that everyone had enough to dye and I wasn't too worried about using the extra eggs because we were making potato salad right around that time and my kids like to eat them for breakfast or snacks. My son always requests egg salad sandwiches whenever we have hard-boiled eggs and the reason why is because he wants to turn them into Egg Salad Open Face Sandwiches. We did that one night for dinner, but still had quite a few eggs, so I figured we would need another recipe to use some of them up. I found this recipe in a little flyer from Publix and I wanted to try this spin on egg salad. 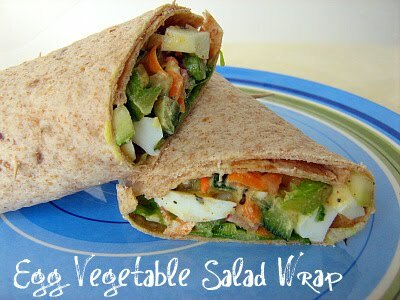 A few more vegetables, dijon mustard and whole wheat tortillas made this a nice twist on egg salad. My family still prefers the egg salad faces, but I really enjoyed this version. In a large bowl combine eggs, cucumber, zucchini, carrot, and radishes. Add the mayo, dijon mustard, basil, salt, paprika, and pepper. For each wrap, place a lettuce leaf on a tortilla. Divide chopped tomatoes evenly on top of the lettuce. Spoon about 1/2 cup of the egg mixture on top of the tomatoes. Roll up tortilla and secure with toothpick, if necessary. Cut tortilla wraps in half and serve. Here is another recipe from Eating Well magazine. There were just a lot of recipes in this issue I wanted to try! They had a section about snow peas that had some different ideas about how to serve them. 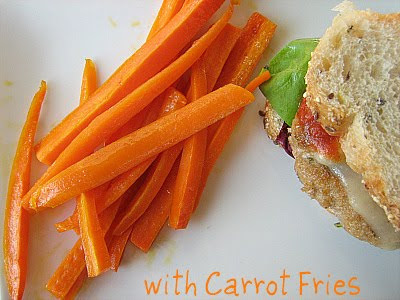 I love finding new ways to eat vegetables, so I was excited about these recipes. 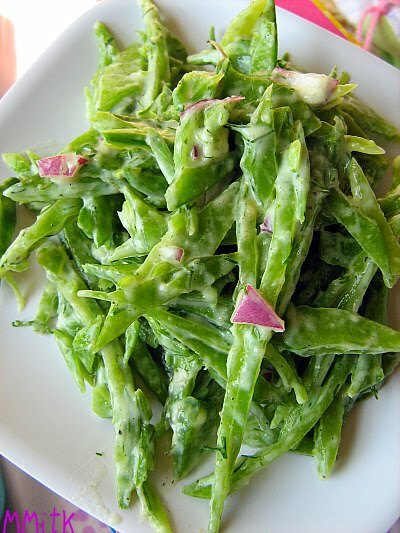 I chose this recipe, which has you slice the snow peas into strips and then serve them with a creamy dressing, kind of like a salad. I don't really like creamy dressings and typically either go with a homemade vinaigrette or lemon/lime juice to dress my salads. My husband and kids like Ranch dressing, but I really prefer homemade over anything bottled or packaged, so I thought I would try this dressing recipe. I always have low-fat buttermilk in the fridge and happen to have some fat free mayo, so I had everything on hand for this dressing. Since the snow peas were raw and the dressing was really easy to mix together, this whole dish was ready in a matter of minutes. I loved the crunch of the snow peas with the creamy dressing. It was a really good combination. The only problem was that I had a super spicy red onion! I didn't mind, but it was a little bit too hot for the kids. They still ate it, but had to remove the red onion pieces. This would make a great side for a picnic or BBQ this summer! Once again, I was looking for an easy dessert that would serve lots of people when we made dinner for a local homeless shelter recently. 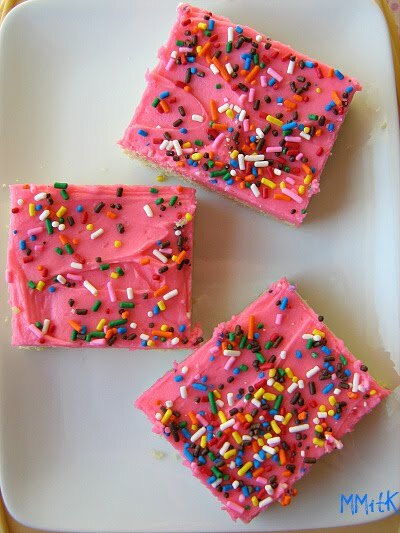 Bar cookies always seem to be one of the easiest things to make when it comes to crowds and I had a lot of pink frosting leftover in the fridge from a cake that I had made that weekend. I had seen these sugar cookie bars on multiple blogs and they were the perfect way to 1- feed a crowd and 2- use a ton of pink frosting. The cookie dough was really easy to mix up. I decided to add a little flavor by mixing in the zest of one lime to the sugar before creaming the sugar and butter together. 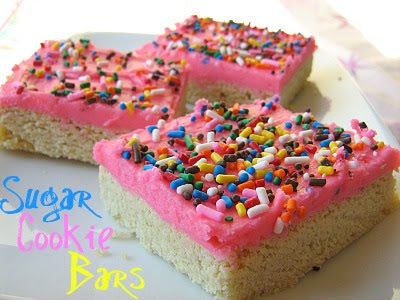 That really added a nice little zip to these cookie bars. These turned out to be perfectly chewy and delicious. A big hit with everyone who tried them. I even snuck a little slice just to make sure they were yummy. They were. I thought I would share a couple pics of the cake I made for a baby shower(which left me with all that leftover pink frosting). It turned out pretty cute. 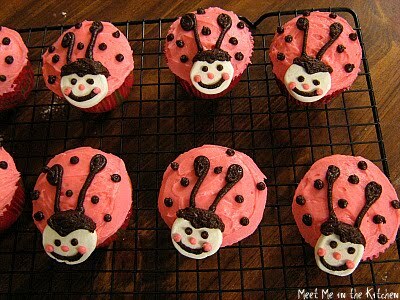 I came up with the cupcake design by slicing the end off of jet-puffed marshmallows for the faces to match the cake. Bad lighting since it was late at night when I took the pictures, but I heard that the cake and cupcakes were quite a hit at the shower. 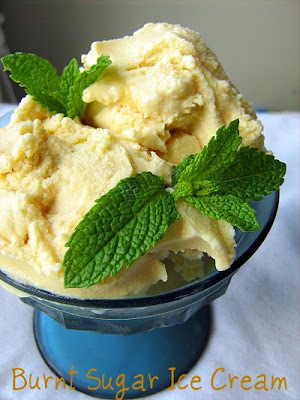 * I added the zest of one lime to the sugar-mixing it together with my fingertips until very aromatic, before creaming the sugar and butter together. With an electric mixer, beat the butter, sugar, and vanilla extract at low speed. Add in milk, bit by bit, until the mixture has reached a spreadable consistency. 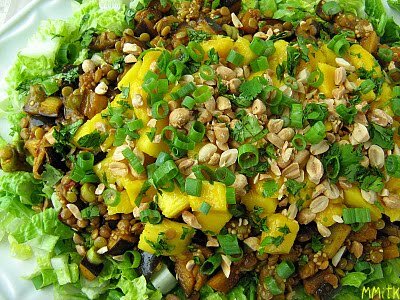 The most recent issue of Eating Well had a section of great salads. I wanted to make every single one of them. So far I have made 2. 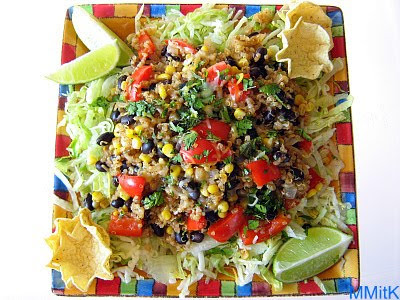 The Spiced Eggplant-Lentil one that I posted a few days ago and this take on taco salad. I liked the idea of a vegetarian taco salad and knew that if I played around with this recipe a little bit it would be a great dinner for us and no one would even notice that there wasn't any meat. Usually when I make tacos I use lean ground turkey and reduce the amount by 1/2, adding a can or two of black, kidney or some other kind of bean to fill in for the "missing meat". Not that I miss it at all. 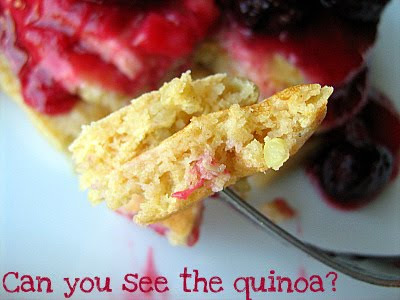 So, I was really happy when I saw this version which had beans, corn, whole grains and other things as the main event. I had to make a couple of changes since my husband doesn't like tomatoes. I used red peppers instead and didn't combine all the salad ingredients. I just layered them on everyone's plates, since some of my kids don't like salsa, I just added that to my hubby's salad and mine. I also used quinoa instead of brown rice just because I already had some that was cooked in my fridge. * I added cumin, subbed red bell pepper for tomatoes and mixed my salad together differently than the recipe advised. Plus, it has many of my favorite things. Eggplant. Lentils. Mango. Romaine. Salad. Nuts. I saw it in a recent copy of Eating Well and knew I had to make it. A couple of weeks ago my church collected food for a local food bank. We walked up and down our street and met all of our neighbors, who willing donated cans of food for the food bank. After the collecting and transporting of the food to the food bank the next day, we had a picnic for all those who had helped. I brought this salad to share. I wasn't sure if anyone else would be as excited about it as I was, but it got rave reviews. Lots of people really liked it. I loved it. I was sad that there weren't any leftovers for me to take home. I guess I will just have to make it again. 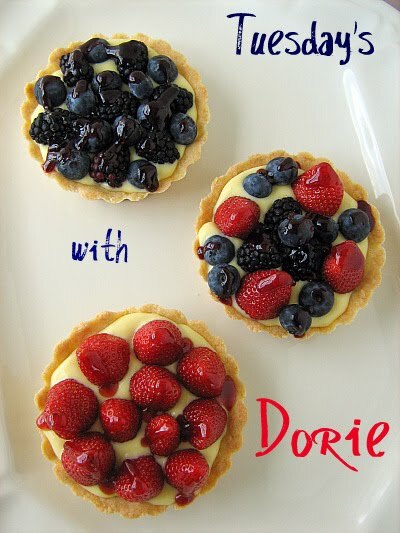 This week's TWD recipe, Quick Classic Berry Tart, was chosen by Cristine- who blogs over at Cooking with Cristine. You can find the recipe on her blog. When I saw this pick my first thought was - Easy. Wierd, how Dorie's book has completely transformed me into a baker who thinks making pastry cream and a tart crust is a piece of cake. We have done it so many times with TWD that it is easy. 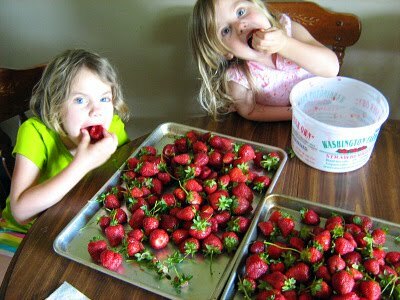 I took my girls to a local farm to pick strawberries, so I knew that strawberries would make an appearance on our tarts. I also found blackberries & blueberries on sale, so we had all three. I decided to make mini tarts and give them away. I made 1/3 recipe of the pastry cream, using a combination of skim milk and half&half (I didn't have any whole milk) and the whole tart dough recipe. I made 3 mini tarts- pressed the dough into the pans and then pressed the rest of the dough into a larger tart pan. I put them all in the freezer. The next day, I baked the mini tart shells, filled them with cream and decorated them with berries. 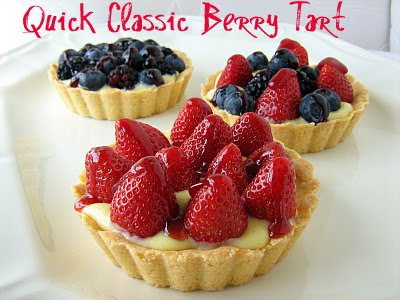 I used Simply Fruit (raspberry & blackberry) as the glaze on my tarts. The amount of pastry cream I made filled the 3 mini tarts perfectly. I took one to my neighbor across the street who gives me fresh eggs from his chickens- since I used his eggs. And the other 2 to my in-laws. Of course all those who tasted the tarts raved about their deliciousness. Who thought anything else would happen? 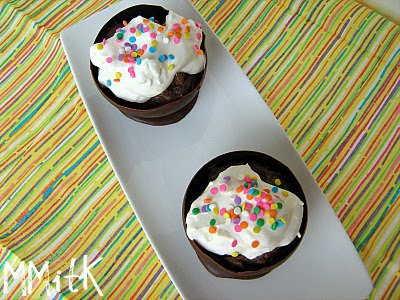 Go check out the other beautiful tarts that my fellow TWDer's made this week! Since I had the eggs out and was making a mess in the kitchen anyway, I decided to mix up the custard for the Burnt Sugar Ice Cream that was chosen by Becky last week. It was the most fun I have ever had making ice cream. Watching the caramel seize into a big blob when you add the cold milk/cream (I used 1 cup of skim milk & 1 cup of half&half instead of 2 cups whole milk) and then having it come together into a smooth mixture was so fun to experience. Everyone raved about it last week and rightfully so- It is one of the best ice creams I have ever tasted. 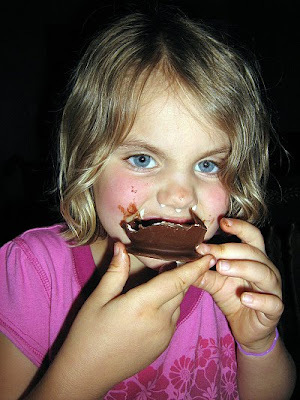 My husband was amazed by the silky texture and delicious taste. The recipe is HERE. If you need more encouragement to make it, check out the links from all the TWD members who made it.